Ancient Egypt was known for its prodigious culture, the pyramids, the sphinx, and the pharaohs of this once-majestic civilization on the banks of the Nile. Poultry was popular among both the rich and the peasants of ancient Egypt. The most commonly consumed poultry included geese, swans, ducks, quails, cranes, pigeons, and even doves and ostriches. Pigeons, geese, ducks and other domestic poultry were considered more popular among the richest ancient Egyptians, and cranes, swans, and wild ostriches would end up as the hard-earned kills of the poor. Duck, swan and goose eggs were also regularly consumed. Most of the time, poultry was not eaten as soon as it was produced, but preserved with seasoning for a longer period of consumption. 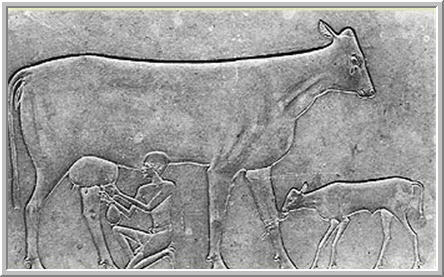 The advent of agriculture and farming saw an increase in the sustained practices of cattle farming in ancient Egypt. Bulls were exclusively used for the purpose of farming, but other livestock such as goats, sheep, and cows were raised for their milk. Cattle farming was very popular, and the size of the herd would represent the prestige of the owner, as well as that of the temple that worshiped those animals. Apart from consuming milk, other dairy products such as curd, whey, and cream were also consumed as popular delicacies. However, based on whichever temple people followed, certain types of dairy products including milk were forbidden in certain places. Vegetables were eaten by the ancient Egyptians as a complement to their regular meals. Every year, due to the flooding of the Nile, much of the land surrounding the river was fertile and ripe for cultivation. Since, most poor families settled on its banks, vegetables were a common foodstuff among the poor. 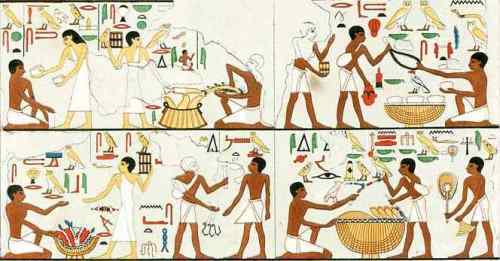 However, they were equally popular among well-off Egyptians too, vegetables being consumed along with other foods such as meat and bread. Onions, garlic, leeks, lentils, cabbage, radishes, turnips, legumes, and cucumbers were among the most popular vegetables to be grown and consumed. Again, since a lot of land was fertile due to the annual flooding of the Nile, a variety of fruits were grown and eaten by the Egyptians. It is difficult to account for all varieties of fruits that were eaten in ancient Egypt, but there is known documentary evidence of fruits which were high in sugar and protein being popular. Apple, olive, and pomegranate trees were brought to Egypt sometime around the reign of Hyksos or later. Grapes and figs were also popular fruits when they were available. Coconuts, on the other hand, were imported luxury goods which could only be afforded by rich Egyptians. The presence of many such fruits in people’s daily diets can be seen from the remains found in several tombs. 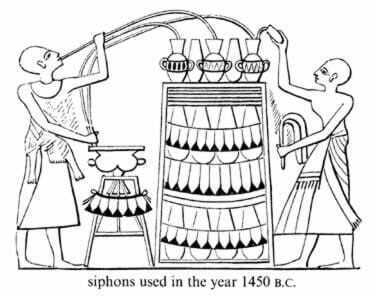 Though not as widely popular as other food products made from fruits (namely beer and wine), fruit juice was enjoyed by a number of people in ancient Egypt. Citrus fruits which had a sweet taste were primarily used for fruit juice. Most popular were grapes and figs, which the Egyptians would press until every drop of juice was drained out of them. As well as honey, the syrup made from unfermented grape juice and other fruits such as raisins, dates, figs, carob, and even the root of the chuba, a plant growing in the delta marshes, had a nice sweet flavor and was also used for sweetening purposes. The ancient Egyptians used a lot of food additives and seasoning, mainly oil, in cooking. They had 21 different names for the different vegetable oils obtained from sources like sesame, castor, flax seed, radish seed, horseradish, safflower, and colocynth. Horseradish oil was known to have been very popular. They also liked a lot of spices like salt, aniseed, cinnamon, coriander, cumin, dill, fennel, fenugreek, marjoram, mustard, and thyme. Sugar itself did not appear in ancient Egypt until many years down the line, but sweeteners like syrups made from dates, grapes, and figs were used for sweetening purposes. It is assumed, though not widely supported by evidence, that readily available meat sources such as fish and poultry were staples in the diets of the poor, but Egyptologists believe that it was for the most part the rich people who regularly feasted on meat. As well as game hunted in the delta region or the desert, people kept various kinds of domesticated animals, some exclusively as sources of meat, such as geese, certain breeds of cattle and, until the New Kingdom, oryx antelopes for temple offerings. Beef was generally expensive and would at most have been available once or twice a week, and then mostly for royalty. The poor preferred poultry such as goose, duck, quail, and crane, which saw a turnaround when domestication started from the time of the New Kingdom. Most of the edible fish from the Nile was consumed, with the exception of species that were connected to the Egyptian god Osiris. 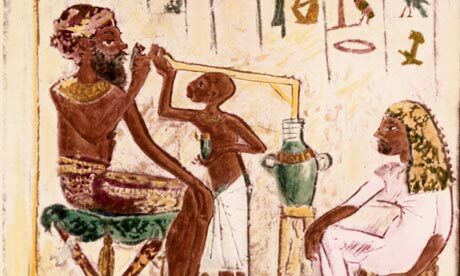 Wine and ancient Egypt have a very rich history. Wine was known to be consumed by the Egyptians as early as 3000 BC. The Egyptian word for wine, jrp, predates any other known word for wine. By the 18th dynasty, wine had become a popular consumer product in ancient Egypt with both red and white wines available to everyone. To make wine, the ancient Egyptians picked a bunch of grapes and squeezed all of the juice out by stepping on them in a trough big enough to hold at least six men. This mixture was sealed in a clay pot with the date and vineyard on it, almost exactly like today. 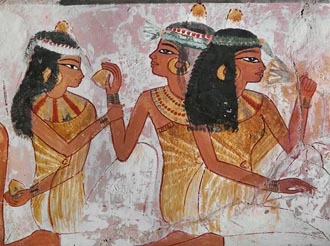 For much of ancient Egyptian history, wine was mostly consumed at the court of the pharaohs. They even appointed an official wine taster. Wine was also a common drink on the menus of the rich and powerful. Bread was an staple food item in the ancient Egyptian diet, but the bread they ate differed in many ways from the bread we are used to eating today. Because of the crude utensils used in making bread, several unwanted ingredients such as quartz, feldspar, mica, and other ferromagnesian minerals were often mixed up with the flour, along with germs and other foreign bodies. Once the flour was made, the bread would be made by mixing dough and kneading it with both hands or even the feet in large dough-kneading containers. To add some flavor, additives such as yeast, salt, spices, milk, and sometimes eggs were added just before the bread was cut into baking pieces. The bread was always rougher and harder because of these extra ingredients, but nonetheless, bread made up the biggest part of the ancient Egyptians’ diet. 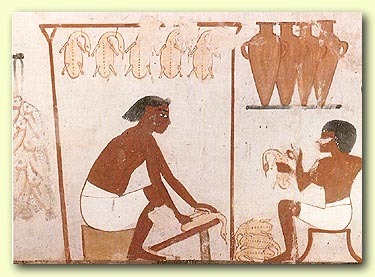 Along with bread, beer was the most popular staple in ancient Egypt, and people drank beer on a daily basis. In fact, beer was the preferred drink of mortals and gods, the rich and powerful, adults and even children. Be it the first meal of the day or supper, beer was always a part of it. It is no wonder that with so much booze in their daily diets, almost all Egyptians lived life on a high. Beer, together with bread, oil, vegetables, and spices, formed an important part of the wages that workers received from their employers. The standard daily ration during pharaonic times was two jars containing slightly more than two liters each. It was supposed to be a healthier drink than the water drawn from rivers or canals which were often polluted. It is clear from the above list that people in ancient Egypt had good eating habits with a variety of food items present in their daily diets. From the rich to the poor, and from the workers to the farmers, regardless of the differences in the quality of food they enjoyed, almost all of them were well fed, with several food options available to them. Food was baked, boiled, grilled, stewed, fried, and even roasted and then served with other seasonings, along with beer or occasionally wine. It is also clear that the food staples that prevailed in ancient Egypt have had a significant impact on the food habits of generations to come.